So, the first real-life images of the 2018 IndyCar chassis are making their rounds of the internet, and I was wondering what the PF1 community thinks of the design. I'm expecting opinion to fall largely along 'party lines', with the people who like complex aerodynamics (such as me) less in favor of the design, and the people who prefer simpler, sleeker cars liking it. So what does everyone think? My own opinion is that the contours of the body itself are quite attractive, and it looks rather good from the side, but I'm turned off by the simple and unsophisticated look of the aerodynamics. And I think the front wing is ugly. I like them a lot. Much better than what they look like today. Looks like I'll be watching more Indy car races next year. Ewe… Still not pretty to me. Looks like it's trying far too hard to appear slippery. The rear wing is vomit… Actually scratch that, the entire thing is vomit for me. Looks like it was designed by a total amateur. For me it's not about the lack of complex aerodynamics so much as it's the lack of character in the look. The entire thing lacks shape and pizazz. The vertical element running along the entirety of the nose cone looks like extra flash like you get from molded products. They look nice, isn't that the low drag aero kit for speedways?? Where are the high down force pics?? The reason it doesn't have complex aero parts on the body is they are trying to generate more downforce from underneath the car so cars can follow more closely. There's a 19% increase in downforce in this area compared to this years aero kit http://www.autosport.com/news/report.ph ... f-2018-car. I wish F1 rules were changed so that wings had to be this skinny. We'd see much more interesting racing. So what happens when a front wheel hits the rear wheel of a car in front, I tell you what, the car gets launched into the air and then into the fence, injuring if not killing the driver, the DW12 helped prevent this with the guards over the rear wheels. I guess that Dan Wheldon's death has been forgotten already. I think the back end looks cool. Not a fan of the front end. I think it looks great, though over time they will probably start hanging stuff on it to make it cluttered looking like they did the DW12. As it is, it is quite clean, looks very aero, and ... in my opinion.. much more aesthetically pleasing than F1 cars. Also I like the cleaner nose without the heavy front wings being hung off of it. Nice and smooth. With some gorgeous livery it will be a winner. Also better looking than current F1. Dallara said that the DW12's wheel guards didn't make enough of a difference stopping cars launching over the back of others, but did cause extra problems with debris and cutting tyres, that they didn't feel they were worth keeping. edit: even in the Wheldon crash, he didn't flip off a tyre, he hit the side of a spinning car that launched him into the air. I like the shape, but it does look very, very basic for what is a top level open wheel series. I imagine that will change soon enough when all the little winglets etc start popping up. Keep in mind these are the low drag oval configuration. The street/road course will look more like we're used to but less cluttered looking than the current design. Over all I'm liking it and can't wait to see them with full liveries. I like it. Looks basic but very racy. F1 should go a similar route, not in design but having simpler aeroregs. There are plenty of ways to design rear tire guards to at least minimize launching due to wheels coming together. It didn't have to be that exaggerated monstrosity the DW12 featured. It can simply be a tubular guard just behind the tires and if made from carbon fiber, it would hardly be visible as it would blend in with the all the dark suspension components. Additionally the reason the wheel guards of the DW12 did little to keep cars from launching is simple… There is nothing extending rearward to keep the front end of a car coming into contact with the guards from shooting upwards. If they designed it so that the upper surface extends rearward about 16", any car coming too close to the rear of a car ahead may want to launch but the extended portion of the guard would send it right back down. Ideally it would trap the front tire(s) to some degree. Video here of the car's first run at Indianapolis. The rear wing looks far too small and a bit flimsy to me. What are people seeing in that video that makes them think that the rear wing is flimsy? Have you ever seen the way F1 rear wings move and oscillate in the rear facing onboard shots? I'm quite sure that the folks who work at Dallara know a good deal more about this stuff than the average forum poster and have done plenty of simulation and practical testing of this wing. I doubt we'll be seeing these wings shaking themselves apart or coming off while on track. Loving the simplicity of the design. It has a certain visceral line to it and the rear view resonates very strongly - almost early F1 slim ground effect style. The tell for me will be if they race well at close quarters...one of the objectives of the design, I believe. 1) It looks very modern, so that's a success. 2) It also looks unique. But then, the last one did too. 3) It looks like a lower series car to me, not a top-level car. I do like the part about producing so much downforce from underneath the car - in theory. We'll see how well it works in the real world. If it lets the cars follow and race more closely, and nobody has an accident because the ground effect failed going over a bump, then hopefully F1 will take notice of that part in the future. I still don't like the way it looks, but that's secondary to how well it works, I suppose. I come from the aerospace world, and classic designs were sleek and smooth, devoid of extra fences or vortex generators. And if they were installed, they were a solution to a component that should have been designed better. State of the art jet fighters (such as the Su-35) appear extremely simple and clean in appearance. In Formula One the extra winglets and parts are there because of just one simple reason. The regulations leak, they are poorly constructed and allow aerodynamic engineers to add little pieces of crap where allowed. And if the regulations are so poorly written, I can never accept that this series is the top because it is painfully obvious it could be improved. Everyone talks about controlling costs, yet these loose rules force teams to spend insane amounts of money. That doesn't even make sense. The cars are just the external reflection of the efficiency of the organization that control the sport. And inefficient never equates to "top". Agree. The reason, at least the biggest reason, that there are always so many fiddly bits in F1 is the flat bottom rule. If not for that the teams wouldn't have to muck about with developing so much downforce from the top of the car and it would also clean up the air behind the car and allow for closer racing. Playing devil's advocate here: do you think the following car speaks "TOP series"? Because clean lines, simple wings, no bits and pieces hung on it. Maybe this helps to better understand Exediron's comment. This is what you tend to see in European single seater series: the further you're removed from the top series, the "cleaner" the car gets. It is definitely cleaner, mds, though not very clean in the nose area which looks a bit bulky and the hung below front wing "ruin" it for me. The car, even though cleaner than an F1 car, certainly shows just how clean the lines of the new Indy car is. Sadly, I fear for what the road version of the INDY car will look like, as they too will probably hang a bunch of crap on it as well. I believe (but could be wrong) that the only real changes between the oval and road course configurations are the front and rear wings. Hopefully none of those odd appendages that they were using a season or two ago will reappear. Now that new IndyCar for 2018 is what a I call a racing car. Wow I love it. I'm excited about seeing how this changes things. Great stuff and no more ugly rear pods. Sweet, loving the look of the speedway kit. Looking forward to seeing the road course kit. I'd like to see road course car looks like with the bigger wings but initial impression is that it's a winner in the looks class. After the death of Senna the FIA rushed to make sure the bottom of the car did not run against the ground, hence the rubbing block and flat bottom. Because of that the noses were raised even more and more, in order to force more air under the nose. That also led to all those vanes and winglets and other doohickeys tacked onto the bodywork in pursuit of downforce because the bottom of the car was limited how much downforce it created. Because the bottom of the car could only generate so much downforce, it became more difficult for cars to follow each other, which led to DRS. Because the noses got so high the FIA tried to push them down, resulting in a few painful years of stepped noses and phallic protuberances. And oh yea, somewhere in there we witnessed double diffusers and blown exhausts. What a mess, and caused by one change back in 1995. Lack of foresight, knee-jerk reaction, ugly cars, not exactly what one would expect of a "top" series. 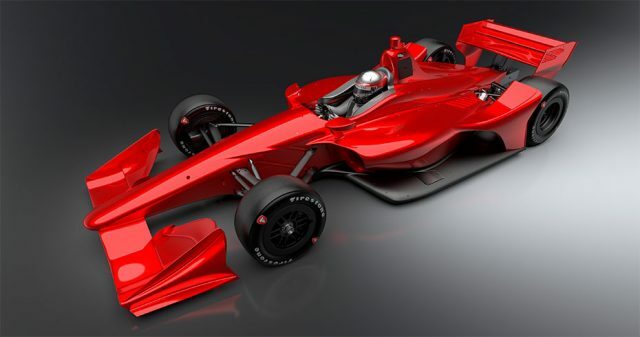 Have no fear, Indycar is less insane than Formula One and the road car looks wonderful. Source courtesy of "The RACER Channel"
The 2018 DW12 will look very similar, the only differences I picked up was the nose strake, slightly different bodywork around the top of the front suspension arms, the bodywork directly behind the driver's head a little less rounded (and more squared off), and the mounting bracket for the rear wing angled forward. The beauty and genius behind all of this is that the basic DW12 car is unchanged, the difference just external wings and bodywork for either road or oval. This will keep costs down, and allow teams with smaller budgets to survive. Last edited by Blinky McSquinty on Wed Aug 02, 2017 7:27 pm, edited 1 time in total.